family. Perfect alongside roasted or grilled salmon. 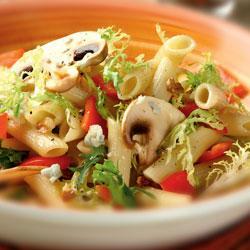 In large bowl toss together pasta, frisee, mushrooms, and bell pepper. In small bowl whisk together oil, vinegar, garlic and salt and pepper; pour over salad and toss well. Add cheese and nuts, toss again and serve immediately.